The IS-7 is a gift Rank V Soviet heavy tank with a battle rating of 8.3 (AB/RB/SB). 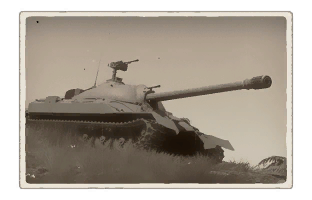 This tank was introduced in Update 1.79 "Project X" as the main reward of Operation S.U.M.M.E.R. 2018. The IS-7 is the culmination of decades of heavy tank development by the USSR, combining distinctive features of previous iterations of the IS series with more modern technology like an assisted loader. The IS-7 is the ultimate 'super heavy tank', rivaling the Maus and E-100 in pure survivability, with a massive 130mm naval gun. Nigh impenetrable from the front, even with all but the highest penetration HEAT rounds and ATGMs, this behemoth is more than capable of standing its ground at 8.0 when played correctly. 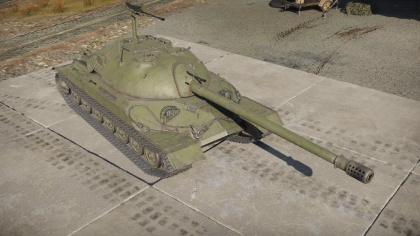 The IS-7 looks quite similar to the IS-3 and T-10M, however due to the assisted loader and much heavier armour, the turret is significantly longer. It has machine guns strewn all over the hull and turret, and a distinctive gun with a perforated cylinder type muzzle brake. Its’ top mounted 14.5mm KPVT machine gun is on an extremely tall spindle mount. As with previous IS tanks, the IS-7 should be played at close to medium ranges, as the monstrous short-range power of the gun falls off with range. Unlike previous models, the IS-7 has far fewer issues with flankers, as the majority of its side armour is leagues ahead of what the earlier machines had. The frontal armour is impossible for almost any kinetic round to penetrate, and with very few weak spots it can be frustrating to deal with. The weapon has a fantastic assisted loader, allowing the 130 mm rounds to be loaded in as little as 10 seconds. This newly upsized C-70 cannon (exclusive to the IS-7) only has APCBC and HE rounds, but with 35mm additional penetration on the BR-482B over the top-tier ammunition from the previous D-25T gun (taking it to a total of 265 mm at 10 meters), an experienced IS driver will be able to deal with the vast majority of enemy vehicles they come up against. In addition to the formidable armour, the IS-7 has no less than 8 machine guns, a powerful deterrent for any light vehicles that may stray into the path of this machine. To top this off, the IS-7 has a significantly more powerful engine than previous models, with over 1300 horsepower relieving the acceleration and manoeuvrability issues encountered prior without costing at all in reverse speed or top forward speed. IS-7 drivers should not be deterred by any terrain, as the wide tracks and powerful engine will make quick work of any surface. The IS-7 should be played as a breakthrough tank, pushing forward to enable team members in lighter vehicles and secure objectives. Beware, however, that it’s not entirely invulnerable and experienced opponents may take advantage of the few small weak points the vehicle has. In addition, some high-calibre HESH rounds (such as the FV4005 and Conway will have no trouble disabling your vehicle almost regardless of where they land. Always be aware of what you may encounter! Suspension wheels are 20 mm thick, tracks are 30 mm thick, and torsion bars are 60 mm thick. The IS-7, similarly to the rest of the IS line, should be played as a breakthrough tank, taking advantage of its extreme durability, and avoiding long-range engagements where its shells simply lose effectiveness. With upwards of 450mm of effective armour in places, there’s no need to shy away from taking on almost any opponent. The IS-7's extremely thick and well-sloped armour means that the player can comfortably engage multiple threats at once without fear of being penetrated through the sides of his/her turret. With heightened awareness and a good sense of targeting priority, a well-rounded IS-7 player can swiftly clear out entire enemy squads with ease. The IS-7 is capable of destroying almost any machine on the battlefield and should have no qualms about combatting anything on the right terms. However, it’s best to be wary of tanks with ATGMs, high-penetration HEAT, large-calibre HESH and anything with APFSDS, as they are able to disable you, often through your frontal plate. If you don't have any powerful chemical warhead, or just got suddenly attacked by IS7 point-blank, the highlighted weak spot on the bottom of the turret your only real hope, since you won't have time to look for any others. APDS or other strong shells with the power of ~280 mm should be able to breach the 250 mm thick mantlet bottom even if it's a bit angled, potentially destroying horizontal and vertical turret drives as well as cannon breach. After that you should rush IS-7 down and destroy it ASAP, as it shouldn't be able to use it's gun and turret anymore. It’s best to avoid taking the IS-7 on if it stands any chance of firing back - it’s very likely that if it gets a shot off, it will be able to destroy your vehicle. Try to disable the gun, or if behind or to the sides, attempt to take out the ammo - the primary store is in the back of the turret, with excess ammunition stored in the upper sides of the hull and beside the driver, as well as a small stash right below the gun breech. If forced to engage the IS-7 from the front, attempt to fire through the turret optic (just above and to the right of the gun when looking at the front), as this is your best opportunity to disable the gunner and the breech. Shooting from an angle significantly reduces the amount of effective armour your shells have to penetrate. The IS-7 can be vulnerable to trap shots or high-calibre HE rounds above the driver’s port, although it does have significantly more armour there than the IS-3. Powerful ATGM's can easily breach hull armour and potentially take out 3 crew members, or explode excessive ammo near to tank's front. Smoke and cannon: To make this tactic easier, it's best to ask your scout ally (usually light tank) to "Scout" it constantly if they can. Use smoke shells to completely blind IS-7 and get as close to it as possible. Avoid being hit by numerous machine guns, as it will try to use it to detect you or destroy your scout buddy. Do not drive in a straight line after shooting smoke shells. After getting close, it's advisable to drop even more smokes (the hull mounted ones or the engine exhaust system works perfect, as you don't really have a lot of time), just to make sure that his teammates won't be able to stop you, then try to find out it's rear and set its engine on fire. After that, keep circling around it, setting it on fire and keeping the smoke screen up, or find it's turret's back and destroy the tank with a single well placed shot. As an example of all the attack methods, we will use this 8.3 battle rating fight. Firstly, IS7 got antagonized by another IS7 and M70A1 (AOS) which counts as overkill and heavy numbers. SPAA used this opening to flank it and break its tracks. Since it's lightly armoured, APHE didn't detonate. IS-7 didn't expect such trickery and didn't even bother to fire its HMG. Being outnumbered 3 to 1, it drops smokes, which was a mistake, since it only helps IS-7s enemies to get even closer, while SPAA returns to distract it and damage every MG it has, now in range, where it can circle around it safely. By the time that smoke disappeared, IS-7 got damaged by SPAA's teammates, and it finishes the tank off by unloading APDS magazine into the back of the turret point-blank. Overkill: If you are a proud owner of FV4005, Type 60 ATM, Sturmpanzer 2, M50 Ontos, FV 4004 Conway, BMP-1 (AB), and some other vehicles with weapons that have extreme overkill potential (usually at the cost of all the mobility and/or all armour), this is your time to shine. 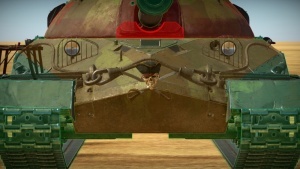 Aim for the weak spots, or simply fire at the left side of the hull (for you it's on the right if the tank is in front of you), depending on your weapon type. If IS-7 has full ammo loadout, it will most definitely explode. In type 60 ATM's case, you can even drop ATGM right on top of its roof or swing it into the side of the turret. Since it's not completely round, unlike most soviet designs, it has lesser bounce chance. Combat SPAA: This may sound absurd, but IS-7 can easily be doomed by SPAA. SPAA can easily use some cover to attack it's exposed track with cannons, making moving IS-7 topple over, then destroy second track, to immobilize it. Even if IS-7 fires back at it, APHE is going to over penetrate, if it's armour is less than 15mm. After that, someone can be called in to make a clean side shot (about 170 mm penetration required for sides). In case if SPAA is combat-capable and has APDS shells with 110 mm of penetration, it can try to get behind the turret, while breaking every MG with autocannons, to execute it personally. If IS-7 is aware of your intentions and keeps tracking SPAA with the turret, just set vehicle on fire by damaging the engine, the foe will have to extinguish the fire eventually, or face consequences. The development of this advanced Soviet heavy tank began in early 1945. Several outstanding scientific groups got involved with the work at once, and the new vehicle was supposed to combine all the latest developments and a great deal of military experience in the design of heavy tanks. After creating several prototypes and experimenting with the engine, armament, and suspension, a steel giant was born and christened Object 260, with the letter designation IS-7. Weighing 68 tons, the heavy tank was equipped with a naval diesel engine that took the monster up to a fantastic 60 km/h. The tank was armed with a powerful 130 mm rifled cannon with mechanized first-order ammo racks and an amazing eight machine guns: two high-calibre 14.5 mm KPVs (one twinned with the cannon and the other an anti-air gun) and six 7.62 mm RP-46 machine guns The armor of the IS-7 is its main feature with high protection value, along with a range of advanced technological solutions, some of which were successfully used on more modern tanks. Unfortunately, the tank turned out to be very expensive for a country that was recovering after World War II. Mass production would involve a range of technological problems. In addition, transporting the giant IS-7 was very complex, it required special railroad platforms and the tank’s weight exceeded the maximum load for the majority of Soviet bridges of that time. After the construction of several prototypes and a limited experimental series, the project was closed. This page was last edited on 9 March 2019, at 05:22.